This blog is now located at http://unofficialaccessstuff.blogspot.com/. Those of you that are just now making the switch to the Ribbon world, will find this valuable. TechRepublic lists a number of areas that you might explore when training is needed for a new Office version. "Instead of telling your users to go out to Microsoft.com and do a search, put hyperlinks to the printer-friendly version of tip sheets and articles on your companyâ€™s main portal page. Providing links to information you know they need will help you cover the training bases. And presenting the links on an internal web site they already use will show your users that itâ€™s okay to go outside of their four firewalls to learn something new. Include your favorite hyperlink in your signature line so it goes out in every e-mail you send." Describes the different template categories and the locations of templates in 2007 Office programs. Also describes the registry settings that control where to find your custom templates. This collection relates to the transition to 2007, but most are also appropriate for 2010. "The main intent of these tutorials is to guide frequent users of Microsoft Access through the transition of earlier versions to the new 2007 edition. Throughout the different tutorials . . . topics from program specifications through features added, dropped, or unchanged as well as demonstrating implementations of subjects discussed." "You can merge Microsoft Office Access 2007 data with a Word 2007 document by using the Mail Merge Wizard. This demo shows you how to create a simple form letter and how to troubleshoot problems. You can also use this feature to create address labels or any other type of Word document in which you want to display Access data." It's generally considered good form to close all forms and reports when you're shutting down a database. Here's a link to some code that takes care of it for you. Open the first form in Design view. Double-click the Form Properties button. Click on the Event tab. Click in the On Deactivate text box. At the prompt, enter: Me.TimerInterval =1. In the Form Properties window, click in the On Timer property text box. At the prompt, enter: DoCmd.Close. When viewing a table that has many fields in Design view, you have to scroll up and down to review the field names. This can be tiresome when you're referring to them constantly, and particularly when you're working with several tables. The following code produces a field listing for a given table. This can then be copied to Notepad and printed for easy reference. Enter the code into a module, substituting your table's name where appropriate. Press Enter to produce the listing. Build a dialog box with as many combo boxes as you need. 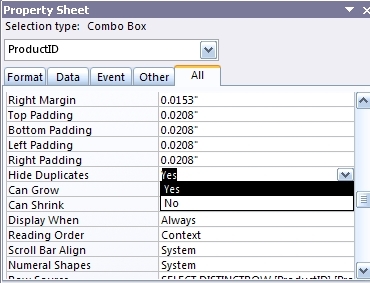 Design a query to read its criteria from the information on the dialog box. Create a macro or visual basic procedure to tell them both what to do. This tip is useful in a number of applications. When you name an object, include a prefix that identifies the type of object. When naming a table for Customers, use "tblCustomers" . You could also have a form for customers. It would be "frmCustomers" . It's called Hungarian notation because with the prefix, it does not look like an English word. Dr. Charles Simonyi developed the convention at Microsoft, and he is from Hungary. He wrote an article on Hungarian notation for MSDN, the Microsoft Developer's Network. When you add form or report controls, the Text Align property defaults to General setting: characters align to the left while numbers and dates align to the right. When you set up controls to act as headings or titles, you can achieve interesting visual results by changing the Text Align setting to Distribute (This is called Justify in Word). This setting distributes characters within the control evenly to span its entire width. If you apply this setting to a textbox control, the alignment switches to Left alignment when you click inside the control to allow for easy data entry. The text aligns to the left; numbers and dates align to the right. The text, numbers, and dates align to the left. The text, numbers, and dates are centered. The text, numbers, and dates align to the right. The text, numbers, and dates are evenly distributed. Here is a study about how color effects a reader's choice of concentration. It was intended for newspaper publishers, but the same knowledge can be used in Web design, PowerPoint, or any other reporting application. Word and Excel will also benefit. The Poynter Institute is a school for journalists, future journalists, and teachers of journalists. You can create hyperlinks in Access that jump to other Office documents. The process of specifying the document and the bookmark you want to jump to can be cumbersome. There's an easy way to specify where in a Word, Excel or PowerPoint document that a hyperlink should jump to, without even having to open the Insert Hyperlink dialog box. Open the target document and the Access table that contains a hyperlink field. Select some of the text at the beginning where you want the hyperlink to jump. Hold down the Ctrl key, drag the selection to the Access hyperlink field you want to set up. When you release the mouse button, the previously selected text is used as the hyperlink text and the link becomes active. When you're testing procedures, you can temporarily convert a block of VBA code to comments that will be ignored during a trial run. Doing so manually by inserting an apostrophe before each line of code can be a real chore. Choose View >Toolbars>Edit from the menu bar to display the Edit toolbar. Select the lines of code that you want to turn into comments. Click the Comment Block button on the Edit toolbar (it's the sixth button in from the right end of the toolbar). Each line of the selected code is now preceded with an apostrophe. To convert the comments back to executable code, select the appropriate lines and click the Uncomment Block button, which is immediately to the right of the Comment Block button. It's easy to hide duplicate entries when you run a query, even though Access doesn't go out of its way to call attention to this ability. Set up a query as usual using the design grid. Choose View>Properties from the menu bar to display the Query Properties dialog box. Change the Unique Values property to Yes. Access displays unique records based on each field returned by the query. Access provides an easy way to export data to Excel through the Office Links feature. 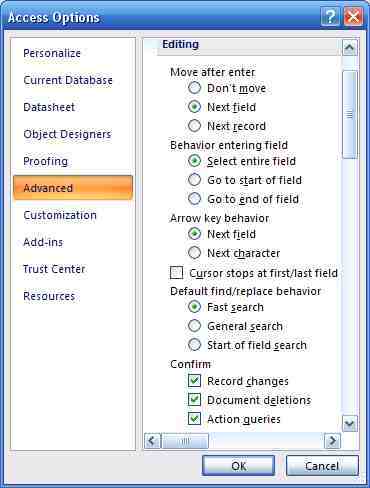 To use this feature, simply select a relevant database object and choose Tools>Office Links> Analyze It With Excel. The worksheet Excel creates includes some minor formatting applied to the field headings that appear in row 1. Some formatting in your original Access database affects the worksheet cell formatting as well. For example, if you're exporting from a datasheet, gridline and font attributes are carried over to Excel. If you use the Office Links feature to export data behind a form, text box shading and font properties are applied. The final result in Excel may not exactly match your Access data; however, you'll probably find that less work is required to get your Excel version of the data into an easily readable state. Sometimes, you may have data that needlessly clutters a report. For instance, suppose your report is listing the fields strCompany, strFirstName, and strLastName. If there are multiple names listed for each company, and the report is sorted by company name, repeating the company information is unnecessary. You may want to set a group header based on the company name, but there's an easier way to hide the redundant data. Open the report in Design view. Select the control that displays repetitive information. Display the control's Property sheet. Set the Hide Duplicates property equal to No. Finally, Save and preview your report. If the data in the modified control is the same as the data from the previous record, the control is hidden. Processing E-Mail Orders using Outlook and Access. They have include sample database downloads and the code needed to make the engine work. "Using Microsoft Access and Outlook together can reduce manual processing of Ordering emails very substantially. I know this because sometimes it would take up to 15 minutes to undertake all the little steps of saving customer details into tables and newsletter lists. Also without software, it was very difficult to explain to other staff members what to do when an e-mail arrived. Now we can process the orders in a couple of minutes when Outlook email arrives in the correct folder." When you add controls to forms and reports you'll often need to add several of the same type, such as when creating a group of option buttons or a series of unbound text boxes. In such cases, repeatedly moving between the Toolbox and the object you're designing can quickly become tedious. Fortunately, you can make the process easier. When you select the control you want to add from the Toolbox, double-click the control button (like double-clicking the Format Painter). Doing so lets you add as many controls of that type as you need. When you finish, click the button again to disable the control tool. Access tries to prevent user errors that would have calamitous effects on data or an application by throwing up confirmation boxes before potentially dangerous actions. This provides users with an out before committing irreversible changes to the database. Although you probably want these confirmation dialog boxes in place for end-users, you may find that they slow your work down too much. You may, also, click through the dialog boxes so quickly that they're essentially ineffective. If you have a programmer's version of hubris, you can prevent Access from displaying confirmation dialog boxes. To do so, choose Tools>Options from the menu bar and click on the Edit/Find tab. Then, clear the appropriate check boxes in the Confirm panel that correspond to the dialog boxes you want to suppress. Good luck, you've been warned. In such a case, only the last variable, strMI, is actually declared as a String type. The first two variables are designated by default as Variant data types. Kim Hedrich has put together a series of basic articles on AutoShapes for TechTrax. There are a couple of ways to limit the data that is displayed in a Query or in a report. Create a query to use as the RecordSource of your report. Flexible: user does not have to limit report to from and to dates. Better interface: allows defaults and other mechanisms for choosing dates. Validation: can verify the date entries. Allen Browne has supplied a clear explanation along with some typical code. The Office of Technology Services of Towson University, located in Towson, Md., provides Self-Help Training Documents for many applications. They are available for many levels of knowledge. Theyâ€™re clean, clear, and concise.